Rousseau Elementary – LEARN at high levels, THINK interdependently, LEAD with character. 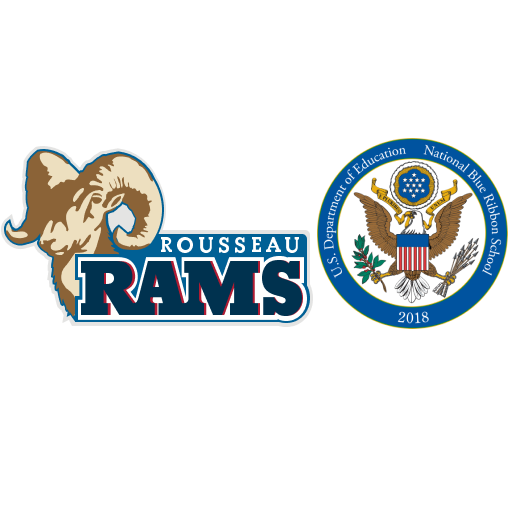 Welcome to Maude Rousseau Elementary School ~ Home of the Rousseau Rams! The mission at Rousseau School is for students to Learn at High Levels, Think Interdependently and Lead with Character. We believe that one of the most important things we do is make relationships with students and families. We have high expectations for learning and behavior. Be Safe, Be Responsible and Be Respectful are our goals for all students. The Rousseau staff is committed to making school a great experience for our students. Rousseau opened its doors in 1964 and is named after Maude Rousseau, a long time Lincoln Public Schools teacher and administrator. There have been several renovations to the original school building which have included the addition of a new gymnasium, additional classrooms and an energy efficient heating and cooling system. The latest renovation was completed in December, 2010. Rousseau currently has 595 students serving students Preschool through fifth grade. We have four sections of classes at each grade, except for First Grade, where we will have five sections this year. Our classroom teachers, Special Education Staff, as well as our specialist teachers, (art/computer, physical education, media, computer and music) collaborate to meet the needs of our students. There are many ways for families and community members to become involved at Rousseau. We are proud to have an active and supportive PTO. Our PTO supports our students’ education and provides a wide range of opportunities and experiences for our students. We encourage families to volunteer in classrooms, field trips or school activities. The Teammate Program is very active in the Lincoln Public Schools. We would be glad to give you additional information about becoming a Teammate Mentor for our students. Rousseau Elementary also partners with Family Service to provide before and after school services for students. Please, take time to view additional links on our website. I look forward to working with the Rousseau students, staff, families and community as your new principal. Please feel free to stop by or call if you have any questions.